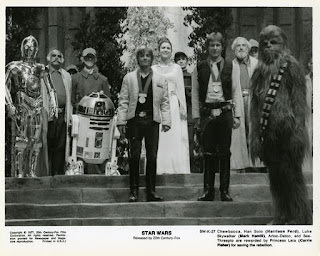 STAR WARS AFICIONADO WEBSITE: 'STAR WARS' AT 40: THE VICTORIOUS LINE-UP! "Luke, Threepio, Han and Chewbacca enter the huge ruins of the main temple. Hundreds of troops are lined up in neat rows. Banners are flying and at the far end stands a vision in white, the beautiful young Senator Leia. 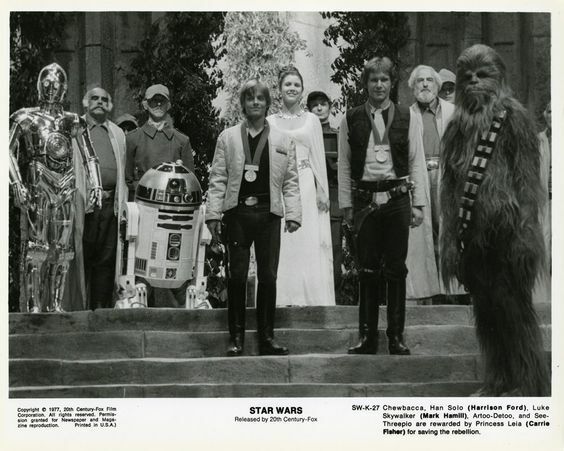 Luke and the others solemnly march up the long aisle and kneel before Senator Leia. From one side of the temple marches a shined up and fully repaired Artoo-Detoo. He waddles up by the group and stands next to Threepio who is rather awestruck by the whole event. Chewbacca is confused. Dodonna and several other dignitaries sit on the left of Princess Leia. Leia is dressed in a long, white dress and is staggeringly beautiful. She rises and places a gold medallion around Han's neck, then repeats the ceremony with Luke. They turn and face the assembled troops, who all bow before them."